This is such a well made and versatile piece of furniture, perfect for use in my teen's bedroom. It is easy to assemble, looks great and is affordable! Bring mid-century modern style to your room with this timeless Cordova bed from Porch & Den. 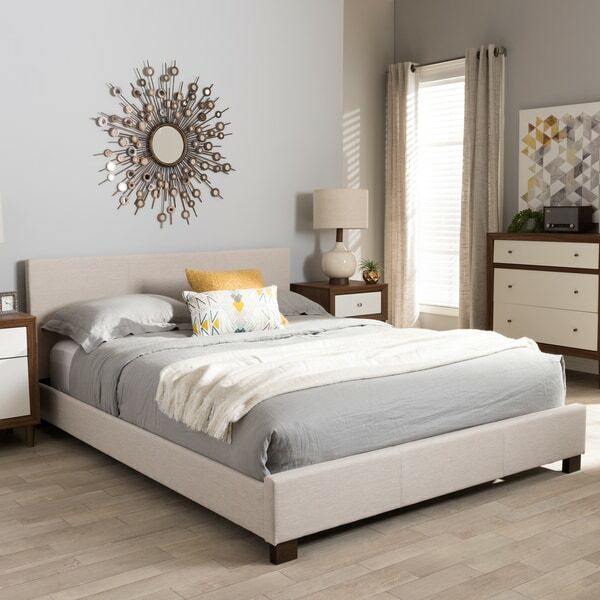 Made from rubberwood, engineered wood, and polyurethane, and upholstered in animal-friendly faux leather, available in grey and beige fabric or dark brown leather color, the lovely bed is designed to be used without the need for a box spring. The rectangular headboard features a low profile and subtle panel stitching for a look that complements the upholstered platform base, and completes the charming ambiance of this attractive bed. 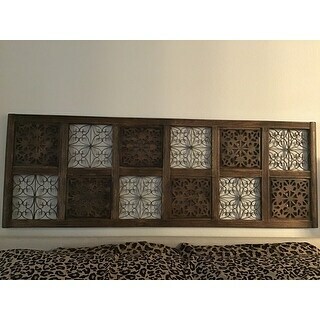 First thing's first: this was my first purchase from Overstock.com. I was really happy about how everything fit into two boxes and they were just sitting outside my front door. My boxes were a little beat up, some small cuts and dents, but nothing that scratched the bed frame. After lugging everything upstairs, I unboxed and completed assembly (by myself) in about 2 hours. The leather look of this frame has a really premium feel to it, I don't think the photos do it justice. For anyone wondering, the finished frame sits about 4 inches off the ground thanks to the small wooden feet. It feels a bit fragile during setup when you're installing the provided slats, but after you put a mattress on it, weight seems to be disbursed evenly. Supports 2 adults and a pug quite nicely. The headboard is only about one or two inches thick, not really pictured, didn't matter much to me. Overall very happy with this purchase, if you're on the fence about this one, I'd say go for it. This bed took my husband and myself approximately 40 minutes to assemble. The instructions were clear. The bed seems very sturdy. We used our box spring with a mattress and it's not too low to the ground. The headboard isn't as tall as it looks in the picture -- with the box spring, mattress, and 2 pillows stacked, there is about 6 inches of headboard visible. The slats are secured with plastic fixtures, which are easy to install. We are happy with the purchase! This platform bed is perfect for using just a mattress and no box springs. It elevates to a perfect height. I added an 8 inch memory foam mattress I ordered from the Big O which makes the height perfect and the bed look incredible. Took a little while to assemble, but looks great and moves well! Easy to set up and easy to move. Only about 10 inches high. Price was excellent, modern upholstered bed exactly like photos - rich, dark brown eco-leather. Took about 40 minutes for husband to assemble. Perfect for older son's bedroom. Very happy! 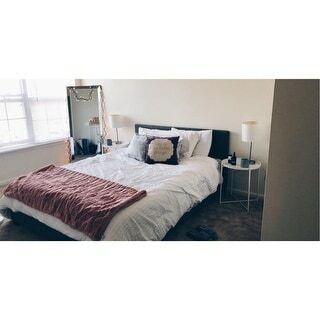 I love this platform bed. It is contemporary and also easy to care for. I love that this bed does not require a box spring. I love the height of this bed. It is easy to get on and off the bed. This bed was easy to assemble. I did have to purchase a 4-inch low profile box spring because my memory foam mattress needed additional support. This addition offset the height of the headboard. My pillows and shams pretty much obscured the headboard. Mt fix was to put an wood and metal decorative panel right above the headboard. Much better. I deducted a star because pet hair really sticks to the material and stub my toes on the frame. This bed is inches from the floor the legs are so short. In the ad the bed appears to be regular / normal height. After reading reviews on this bed, I decided to go for it, save the money I would've spent on an expensive bed, and just fix it up a little bit. Reviews said the slats it comes with are very flimsy, which is very true. What I did, and what I recommend doing, is interlacing some more sturdy slats in between the flimsy ones. I bought 4 thicker pieces of wood from ***, and spaced them out between the other wood. This makes a huge difference, for only about *** more, and will hopefully allow the bed to last me a little longer. The directions are very brief and don't have much instruction, so that's a downside. But most of it is pretty self explanatory. If we didn't have to go to *** it wouldn't have taken more than 45 minutes - 1 hour to put the bed together, with one person to help me. The aesthetic is brings to my room is everything I wanted. It is low to the ground, but I knew that since it is a platform bed. I have gotten endless comments on it. The bed doesn't squeak, or move when I sleep which is very nice. If you're on a budget I would definitely recommend this bed! One of the legs wouldn't screw in and the headboard was partially broken. Very low to the ground. Like so low, the sheets hang to the floor. What I did not anticipate was how low to the ground this platform bed is. My husband is 6 ft tall and I am appx 5’4”. We had to go buy a box spring to put underneath our mattress. Also, the headboard is a bit weak. We pulled the bed from the headboard (before we even added weight with the box spring), and heard a big CRACK sound, so we believe it has been compromised somehow. Can’t recommend this product, sadly. It sure did look handsome online. I really like the look of this bed and I like that it's quiet compared to the one we replaced. It's pretty sturdy for the most part but I did only give it 4 stars because one of the slats broke when my sons friend sat at the end of the bed. I was afraid that the bed would be too low, but with a thick mattress, the height is fine. Simple styling, easy to assemble, and very comfortable. Purchased for my son's first apartment! He loves it and great for the price! Good material and looks great. However the quality of the frame is not the greatest. The bed moves a lot and wobbles on a carpet. The frame should not be set to the highest level because the whole bed will shake. Had to bring the headboard down one level for better support. Only giving this three stars because it sits so low to the ground that it's like a child's bed. You can't store anything underneath it, it's hard to get up from if you're an older person, and it can't be raised up on bed lifts because of the wide shape of the feet. I should have paid more attention to the other reviews. Very satisfied with my purchase. Easy to assemble and sturdy. Thinking of purchasing another one. This bed was great for a while, but after less than a year, the boards under the mattress cracked in certain spots, with only my 70lb son that was ever on the bed. "Do you still have dark leather queen size?" "What is the height not including the headboard and with/without legs? I’m in need of 8” or less." "Specs show both Full and Queen dimensions, however it looks like it's one size when ordering. Is it configurable to fit both mattress sizes somehow or does it end up with a big gap when using full size?" "What is the spacing between slats on the bed? The mattress I'm looking to buy has a 3-4in requirement gap between slats." "Will this be restocked in the dark grey in a size queen?" "Can you use with an air mattress"
"What tools are required for assembly?" Allen wrench provided for bolts, but will need a Phillips screw driver for screws.